This mojito is flaming good! 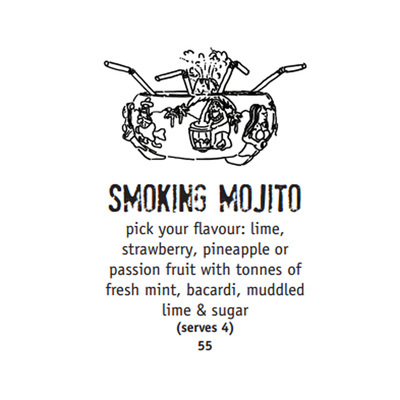 Let me introduce the Strawberry Smoking Mojito on offer at Crinitis, Darling Harbour. 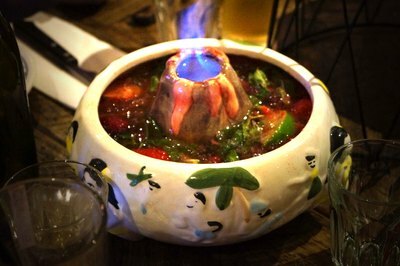 This communal cocktail certainly steals the limelight (literally) in the restaurant with its inner volcano lit by your bartender, served to you with a perfect combination of strawberry and lime liquid lava. Close up of the alcoholic and fruity-licious goodness. It's a healthy cocktail when there's fruit *wink*. The fruit produce was absolutely fresh and is a mixture of strawberries, fresh mint and muddled lime combined with bacardi and sugar. And gasoline in the centre - which is not to be drunk! The flavours are balanced quite well, although being such a large quantity, the flavour of this cocktail would be subject to seasonal change and concentration of alcohol. Heads up, this communal cocktail serves 4 people quite generously - which works out to be $13.75 per person. Yay spare change for coffee! This cocktail is certainly an economical option to share at the table; at $55 it serves four people quite effortlessly. Which leaves more spare change for coffee or dessert, or more cocktails! The spin on this traditional Cuban cocktail never grows old and is a great idea if you're celebrating a birthday as you are entitled to make an extra wish! What is your must have lipstick?